The Sheridan Yellowjackets narrowly escaped defeat as they nipped the Searcy Lions by a score of 7-6 on Friday, September 18. Searcy received the first half kickoff at their own 31 yard line. Sheridan quickly stopped the Lions at the Searcy 38. The Lions punted to the Sheridan 19. On the first play, Scott Herron dodged Searcy defenders all the way down to the Lion 32 yard line. On fourth and three at the 25, Kevin Martin carried the ball 10 yards to pick up the first down. A penalty set the Yellowjackets back 15 yards. On fourth down at the 34, Juan Caple punted into the end zone for a touchback. Midway through the second quarter, Searcy received a Yellowjacket punt at the 50 yard line. The Lions used good passing to pick up a first down at the Sheridan 22. 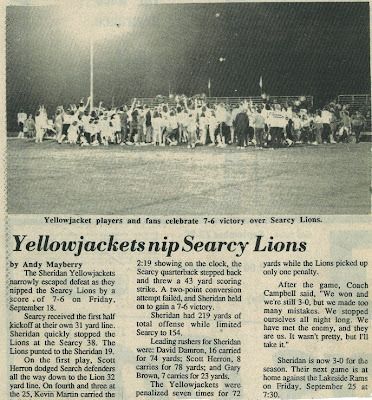 The Yellowjackets stuffed the Lions on three consecutive plays, and Searcy was forced to attempt a field goal. The 37 yard attempt fell short, and Sheridan took over on the 20. Willie Traylor ran the second half kickoff back to the 34 yard line. A 13 yard pass to Andy Crouse gave the Yellowjackets the ball at the 47. A good run by David Damron and a Searcy penalty gave Sheridan a first down on the Lion 15. On fourth down and nine at the 14, Brad LaRue dumped the ball off to Damron who ran it into the end zone for the first score of the game with 8:23 remaining in the third quarter. Larry Campbell’s extra-point gave Sheridan a 7-0 lead. With 2:17 seconds left in the third quarter, Juan Caple punted from the Yellowjacket 21 to the Searcy 47. Faced with a fourth and 11 at the Lion 46, Searcy ran a fake punt which led to a first down at the Sheridan 37 yard line. On the next play, Sheridan was flagged for both pass interference and unsportsmanlike conduct. This gave Searcy a first down at the 11. Brad LaRue intercepted a third down pass at the nine yard line with 10:42 remaining in the game. Searcy took a Caple punt at their own 43 with 4:01 left. A completed pass gave the Lions a first down on the Sheridan 43 yard line. On third and nine with 2:19 showing on the clock, the Searcy quarterback stepped back and threw a 43 yard scoring strike. A two-point conversion attempt failed, and Sheridan held on to gain a 7-6 victory. Sheridan had 219 yards of total offense while limiting Searcy to 154. Leading rushers for Sheridan were: David Damron, 16 carries for 74 yards; Scott Herron, 8 carries for 78 yards; and Gary Brown, 7 carries for 23 yards. The Yellowjackets were penalized seven times for 72 yards while the Lions picked up only one penalty. Sheridan is now 3-0 for the season. Their next game is at home against the Lakeside Rams on Friday, September 25 at 7:30.